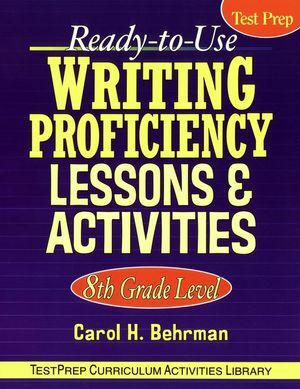 This volume of Ready-to-Use Writing Proficiency Lessons & Activities gives classroom teachers and language arts specialists a powerful and effective tool for addressing curriculum standards and competencies at the eighth-grade level and preparing their students for comprehensive assessment testing. Writing Proficiency Lessons & Activities books are also available from Jossey-Bass at the fourth-grade level and the tenth-grade level. Included are a variety of easy-to-use, reproducible activity sheets that provide application and review the basic language skills as well as extensive practice in producing the types of writing called for in standardized tests. MAKING MECHANICS AND USAGE WORK FOR YOU: apostrophes, hyphens, end marks, commas, semicolons, colons, quotation marks, titles, and misplaced modifiers. ESSAY-WRITING TECHNIQUES: brainstorming, clustering, outlining, writing an introductory paragraph with a question or a surprising statement, developing the topic using examples, avoiding irrelevant details, writing a concluding paragraph, proofreading, and writing a five-paragraph essay. Carol H. Behrman taught writing to students in grades 5-8 for fifteen years. She has written twenty-four books— fiction and nonfiction— for children and young adults and has conducted numerous workshops on the writing process for students, teachers, and aspiring writers. Ms. Behrman has served as writer-in-residence at Chautauqua Institution and has been an adjunct lecturer at Seton Hall University and at New York University's Writing Center.